Every now and then when I share our weekly homeschool wrap ups or an art tutorial, I will get a comment like those above. I always think to myself… if only they knew the drama and trauma that goes on here daily. Also, remember that with a photo, you don’t get all the sensory overload that is happening at the time. The noise! So, let me present you with the same photo and a little more explanation. The Truth Behind the Photo – The Noise. Friends, homeschooling is refinement by fire. Daily, sometimes hourly, we have character issues we have to address. And with five children, there is just always something going on. An adjustment to make. And when that challenge is tackled, then there’s something new to concentrate our prayers on. 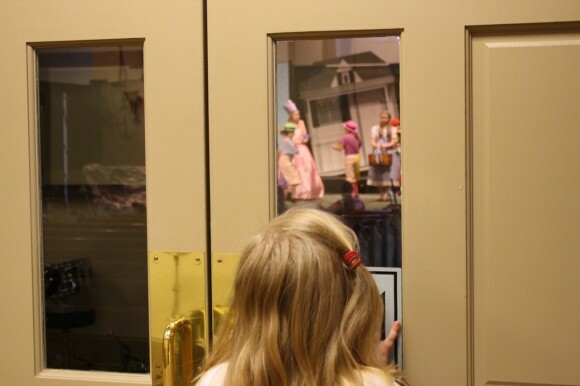 Littlest Girl peeking at her big sister practicing as Glinda in the Wonderful Wizard of Oz this week! Drama – we have three girls. Need I say more? Trauma – someone needing a band-aid, help finding a pair of socks – or my favorite homeschool daily – finding a pencil with an eraser. We’ve also had our share of trips to the ER over anaphylaxis and injury. Drama and trauma all the time with five children. I am a morning person. Some of my children are not. So, we’ve adjusted our Before 8:45 schedule for those young adults that need more rest. And I can at least get the basics done with three children. That’s accomplishment! Homeschooling amplifies and showcases my stacks. I was a stacker of papers even before I got married. And with all these children and homeschool papers, stacks abound. Thankfully, there’s IKEA and chalkboard paint to help. I escape now and then. A long soak in the tub at the end of the day. Just stepping outside when the noise is just too much. That’s not really an imperfection as it is a need. So I can change my perspective and get a hold of the gratitude. 1. 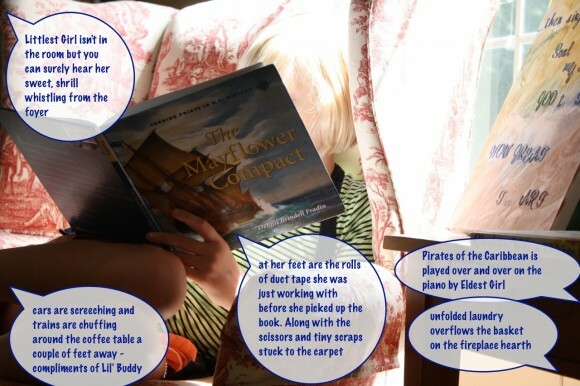 Math manipulatives as part of an elaborate story | 2. We’re still working on getting our garden ready. Pulling weeds in between plentiful rain showers | 3. Construction scene | 4. I’ve decided to make duct tape creations part of the decor. Why So Positive Most of the Time? A few points. I do not write about my children’s failings or speak poorly about them. Not because that doesn’t ever happen but because I fail and make poor choices as well. We are human. A family all piled up together most of the time is bound to lose patience and struggle in one area or another. I also consider that, one day, when they are each much older, what might they find if they were to Google search their own name? Would words I write now somehow wound them in the future? That would never be my intention. I aim to show my love for them through my posts and to encourage other families. I count gifts. I turn to the three steps for savoring parenting. He’s blesses us every day if only we will stop and take notice. So, yes, I do tend to share the highlights, the good, the accomplishments. But I do hope that you will see that we are an imperfect homeschool, a “we’re working on it” sort of family. We struggle. And thank God He’s not finished with us yet. 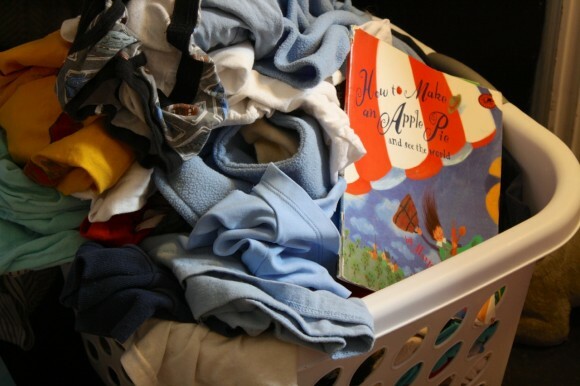 Maybe in the future I’ll be more intentional about sharing those ‘keeping it real’ sort of laundry piles. Maybe that would balance out the glow of the sunshine on a blonde head as she reads a history book by the window. And at the end of the homeschool week, date nights are an absolute gift. There are weeks that I am leaning and reaching for those couple of hours alone with my husband. 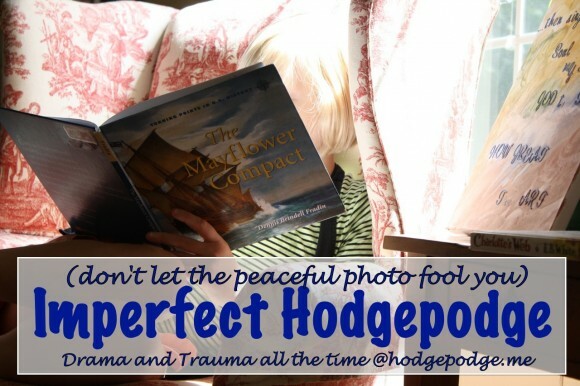 You might also be interested in A Day in the Life at Hodgepodge. 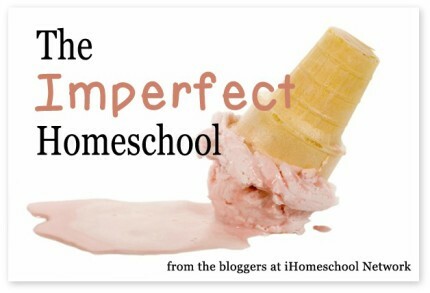 Be sure to visit all the other Imperfect Homeschools represented by the bloggers of iHomeschool Network. 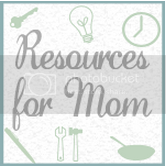 Plus, Rebecca at Mom’s Mustard Seeds hosts a weekly Resources for Moms. Stop by and be encouraged! This is a beautifully crafted post, Tricia — I love how you explain why you don’t go into your children’s shortcomings – because we ALL have them. Somehow, even when you write about the imperfect days in your homeschool, you sound so graceful and calm. You have a gift for that. Part of our job as parents, wouldn’t you say? It hurts my heart when I read others making a permanent record online of their children’s failings. We parents fail too and must be a model of His forgiveness. Thanks Mary – I love the way you balance your encouragement with reality – we ALL have hard days, weeks. Oh yes we do! You wrote of escaping once in awhile to a bath or just a sneak outside to escape once in awhile. I need to train myself to do these simple gestures for myself because inevitably I wait too long and end up irritable and short with my children. I seem to have a bad habit of waiting until I am at my breaking point before asking for help. Allowing myself some regular “mom moments” would probably ward off some of my worst days. Kristen – yes! Jesus set the example. He went away to the hills to pray. Just a little snippet of time – even walking out to the mailbox – you notice a rose blooming or simply breathe a fresh breath of air. Sometimes it’s all it takes. We must renew as mothers. Tricia, it’s a fine line, sharing truth, but protecting our family. Knowing we are all human and make mistakes – allows so much room for grace and mercy. 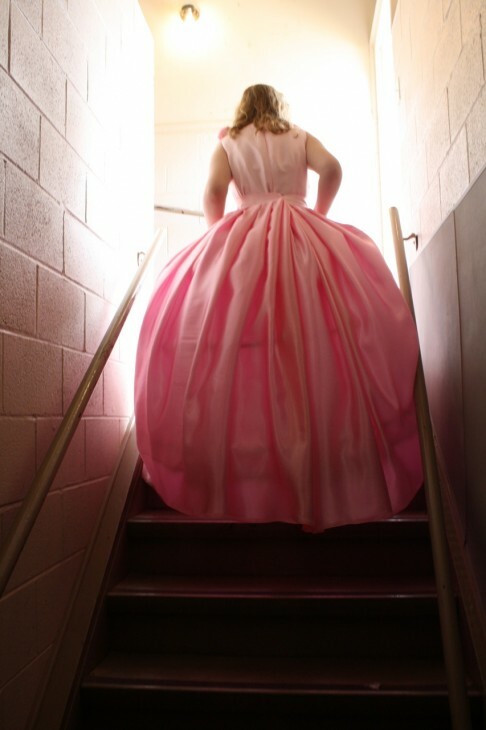 It also allows our children a chance to be just that – children! 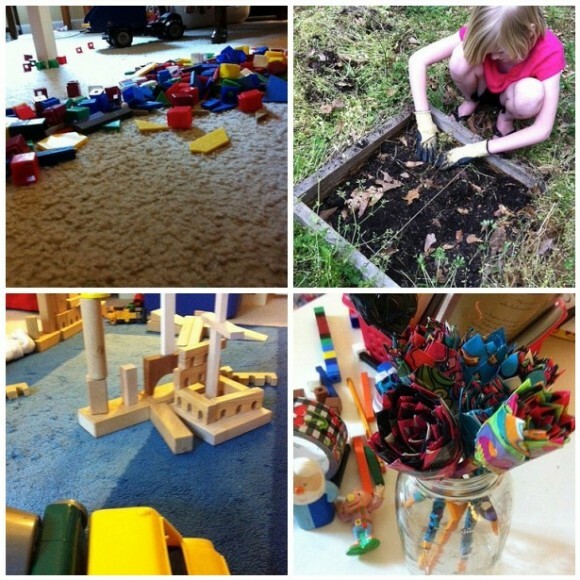 Lovely thoughts, Tricia, on how imperfect we (and our kids!) are and how even though that leads to some tough moments we can still count the gifts. I completely agree about not sharing information that could hurt or embarrass our children, either right now or later in life. And I love the photo with the extra info–we have duct tape stuck to carpet and the noise of an off-camera pretend battle scene pretty frequently here, too. Yes, fellow mama of duct tape crafter! A photo – even though it is a picture – is only a snapshot. The big picture is so much more – complete with the sounds of a pretend battle scene. Thanks Heidi! I always learn from my wise friend’s words. Thank you for being you. I subscribe by email and rarely make time to come over and comment, but TODAY. Oh today, what a great encouragement this was as I just nodded and agreed the whole way through this reading. Thanks, Trisha! 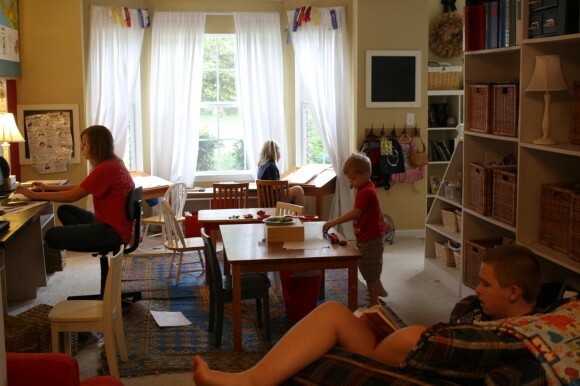 “Friends, homeschooling is refinement by fire.” YES! And I keep reminding myself that refinement by fire can not be fun for the metal – just think about the process! Love the explanation of the photo! It is so important to focus on the positive while recognizing the imperfections without dwelling on them. Oh Tricia. The NOISE. I’ll be honest that the noise is what makes me feel like I am going to lose my mind some days. It’s not the chaos but the deafening noise at 5pm that I just can’t take. Oh yes, the pieces of duct tape on the floor!! That made me chuckle. The noise can be overwhelming and I love the sweet sound of my hubby’s car in the driveway 🙂 Beautiful post! You are the best Mama that I know! Happy, happy Mother’s Day from one proud mama! As I stood up from the table today, I had the same reflections and took photos around the house. Just writing about it now. I try to tell people that blogging keeps at least small areas of my house clean, so I can get a non cluttered shot. Yes, just yes! Thank you for this post. You sure are a blessing to this weary mama’s heart! Happy to encourage a fellow mama in the trenches!